For most students of politics, elections are their Super Bowl. They get genuinely excited about the campaign, the polls and the debates, hoping that it will culminate in thrilling drama on voting day. Libertarians, on the other hand, may follow political developments closely but usually have no particular interest in the outcome of a vote. For those of us who believe that all major parties are largely similar, election night is at most a passing curiosity. Accordingly, many libertarians either don’t bother voting at all or, as I do, deliberately spoil their ballots as a small protest against what we regard to be a system devoid of legitimacy. The provincial election held in Quebec on April 7 was a massive exception to this rule. This time, I was glued to the race. I eagerly awaited every new poll, followed both debates and kept track of every new announcement and development. What made this election special? For the first time since I walked away from partisan politics many years ago, I knew that this one mattered. Indeed, I was (and remain) convinced that it was by far the most important Canadian election in my lifetime. Those are strong words from someone who thinks the only difference between most political parties is the specific ways in which they’re wrong, but the Parti Québécois government elected in 2012 was no ordinary one. When I first arrived in Montreal in 1997, a PQ government was in power. And for the next six years, under both Lucien Bouchard and his successor, Bernard Landry, there was nothing out of the ordinary to report. From a libertarian perspective things were not particularly good, but there was no reason to believe that they would be meaningfully better under the alternative. That theory was validated when the Liberals came to power under Jean Charest in 2003, who for the next nine years led a government that, from my perspective, was virtually identical to the one he replaced. But by 2012, the Liberal regime was showing its age, worn down by an ongoing corruption scandal and student protests that disrupted life in Montreal throughout that year. The PQ and its new leader, Pauline Marois, reaped the benefits, and in September took office with a slim minority. From the beginning, their actions were not encouraging: To appease the students, they cancelled the modest tuition increases that had triggered the anti-Liberal backlash. Given the chronic under-funding of Quebec’s universities, this decision was bad enough. But Marois went further: Her government retroactively slashed university budgets by hundreds of millions of dollars. While, as a libertarian, I would prefer that the education system be privately run, the perfect should not be the enemy of the good. If the state insists on owning universities and keeping tuition at bargain-basement levels, it should at least provide the funding necessary to offer a quality product. The PQ, however, seemed indifferent to the state of Quebec’s post-secondary education system and in particular its crown jewel—McGill University, still one of the very best in the world. The damage to the education system, however, paled in comparison to the government’s repugnant “Charter of Values,” introduced last September. That proposal—later translated into draft legislation as Bill 60—would have prohibited government employees from wearing “conspicuous” religious symbols. In practice, the restrictions would have forced many Jews, Sikhs and Muslims to leave their current employment. Worse yet, the proposed law empowered public bodies to require private-sector contractors and subsidy recipients to impose the same restrictions on their own personnel “if such a requirement is warranted in the circumstances”—as if requiring a man to remove his yarmulke could ever be warranted by anything other than personal distaste. The Charter was, without a doubt, the most odious legislative proposal I had ever seen in this country. While its proponents offered various weak justifications, there was only one real reason to support it: I don’t like seeing people who look different from me. It spoke to the very worst in us: the part of our nature that is closed to outsiders and sees them as a threat to our homes, our families and our way of life. When she won the PQ leadership in 2007, Pauline Marois called on her fellow Quebecers to no longer be “scared of seeming intolerant,” and the hearings on Bill 60 made it clear that they had heard her message. One family related horror stories of having to remove their shoes when entering a mosque in Morocco and being disturbed by the call to prayer in Istanbul, along with their shock at seeing Muslims praying “on all fours.” Another shared his fear of receiving a prostate exam from a doctor clad in a chador. A former nun casually recalled that she once switched cash registers rather than be served by a woman wearing a hijab. Crucially, the cabinet minister responsible for the bill, Bernard Drainville, did nothing to discourage such statements. He saved his opprobrium for those who really deserved it, such as the man who, upon describing a pro-Charter journalist as “racist,” was immediately told not to refer to anyone in that manner within the hallowed space of the hearing room. The suspension of the hearings during the election campaign did little to stop this kind of appalling discourse. Instead, it simply moved to a more public forum. There was, for example, the spectacle of three PQ candidates—including the Justice Minister—calling a press conference to warn that the election might be “stolen by the people from Ontario and the rest of Canada.” What triggered this grave accusation? Some out-of-province students were complaining that they had been denied permission to register to vote despite appearing to meet the legal requirements. While the chief electoral officer dismissed the party’s claims, its message was clear: Those shifty English Canadians are coming for us, and only the PQ can stop them. Then there was the contribution of Janette Bertrand, a Quebec writer who last October proclaimed that she would be afraid of being treated by a doctor in a hijab, since “in her religion, women are not given the same care as men, and the elderly are allowed to die sooner.” Most political parties would steer well clear of anyone who made such statements, but not the PQ. Instead, they invited her to a “secularity breakfast” where, true to form, she intoned that recently, while she was enjoying her building’s pool, two men appeared. Upon seeing her and her friend, they turned around and left. One might think that to be the end of an unusually short and dull story, but in Ms. Bertrand’s mind, it was just the beginning. She continued, explaining that next—in her imagination alone—the two men go to see the owner of the building and offer money to be allowed to bathe only in the presence of men. The owner, eager to please “rich McGill students,” accepts and excludes women for one day a week. A few months later, women have been totally banished forever. In light of all this and more, the results of the election—a crushing defeat for the PQ in which even Pauline Marois lost her seat—were very much cause for celebration and joy even among those of us who want nothing to do with partisan politics. Indeed, at my little gathering of fellow travellers that night, there were smiles all around as the votes were counted and the result became clear. 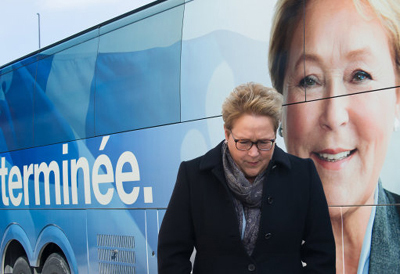 Instead of the majority government that Marois expected to win when she called the election, the PQ has instead been left leaderless and directionless in the wake of its electoral meltdown. I can’t pretend that the PQ’s social policies brought about their downfall. Instead, it appears to have been their inability to avoid the issue of separation and the electorate’s determination to avoid a third referendum. But the party’s implosion does show that when Bernard Drainville warned that a vote for anyone else would doom the Charter of Values, the electorate responded with a resounding “So what?” However many Quebecers liked the proposal, they voted based on other priorities and elected a Liberal government that will surely enact all sorts of ill-conceived legislation but is at least unlikely to try and win support by the politics of division and exclusion. The irony for me is that if the PQ’s vision of an independent Quebec was a liberal, pluralistic and open society in which individual liberty was paramount, I would be among the first to support it. But an independent Quebec ruled by the sorts of people who ran the outgoing government would be the antithesis of anywhere that I want to live. Their loss is very much my gain—mine and everyone else’s who believes in individual rights, and that is definitely something worth celebrating. Adam Allouba is a business lawyer based in Montreal and a graduate of the McGill University Faculty of Law. He also holds a B. A. and an M. A. in political science from McGill. ▪ "There Oughta Be a Law!"